The 2014 Norfolk voluntary championships saw the introduction of new level 7, 6 and 5 rules to replace the previous county level 5 rules which have served the county so well over the past few years. This enabled us to bring many more of our intermediate and development squad level gymnasts within this, our biggest event of the year, and they took their places in the line up amongst our up and coming and more established competitive stars. At the business end of the day, regional finals places were decided at levels 4 and 3, with the young elite gymnasts and experienced FIG stars also having a run out before their regional final. This was probably the biggest Norfolk competition in the women’s artistic spectrum. 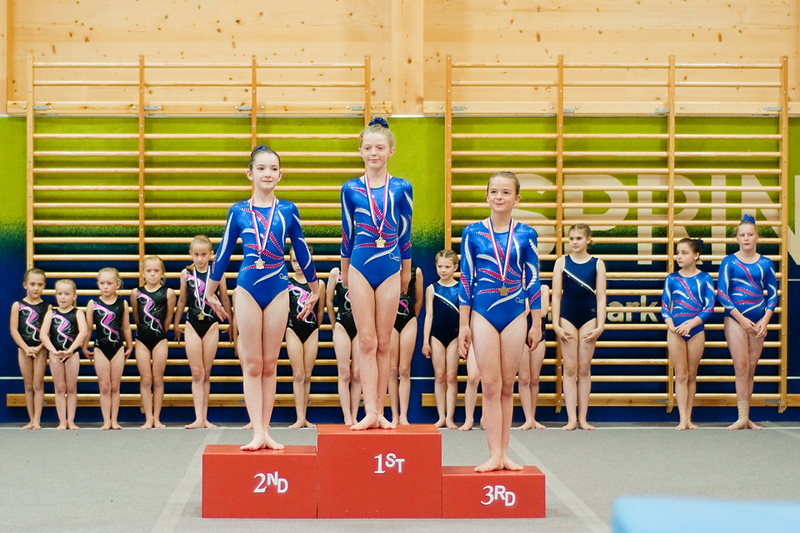 Fifty-five TNAG girls took their places in an overall entry of one hundred and ten gymnasts; meaning that we provided exactly one half of the competitors on the day where six clubs from across the county took part. And from the youngest competitor, Grace Davies who turned seven on the eve of the competition, up to Emily Crowe aged sixteen, the TNAG athletes demonstrated class and composure throughout the rounds and levels and between them, gathered a staggering total of thirty-eight medals. The day began with thirty-five gymnasts contesting the level 7 championships, where the requirements are fairly basic and many of the TNAG competitors came from intermediate classes training only three or four hours per week. 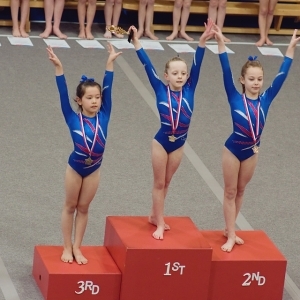 This was the only level that the 2007 born gymnasts were permitted to enter and keeping their level of gymnastics down to a basic one at this age is probably a sensible step. 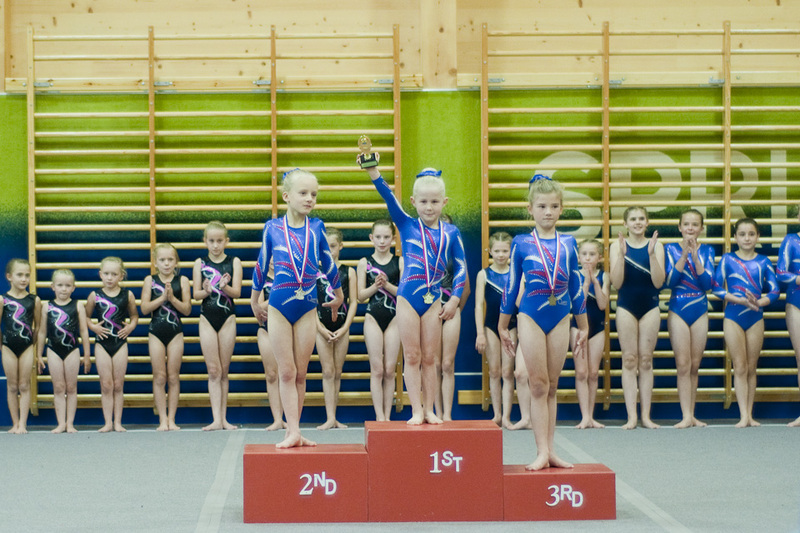 Even so, only six gymnasts had reached the standard required to take part representing only two of the counties’ clubs. 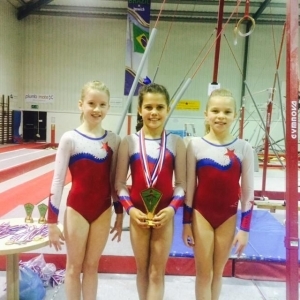 Isobel Rhodes was the sole gymnast from DS07/08 taking part. Izzy has come to squad gymnastics comparatively late but has made fantastic progress and although she had some mistakes today, she has great potential for the future. Izzy finished fifth with a total of 39.70. Sophia Pickering and Lois Hill have had the benefit of more training hours for a longer period and that greater experience told on the day with both girls coping extremely well with the demands of their first county championship. Sophia was particularly strong on bars (12.15, second across the whole level) and floor (12.30; second in the age group) but it was the ability of the TNAG girls in the medal hunt to hit beam which set them so far ahead of their competitors, even with Sophie not doing her absolute best routine her 10.40 saw her take a clear bronze medal with an impressive total of 45.80. Lois was level with or slightly behind Sophia on three of the events but it was her focus and composure on beam which boosted her score. It was fantastic to see Lois showing real focus and composure throughout the event but especially on beam, as she has struggled a little to keep concentration in her friendly competitions to date. Lois’ stuck solid beam routine scored 11.80 and that combined with clean and solid scores on the other pieces gave Lois a total of 46.40 and the silver medal to start off what would turn out to be a very successful day in the Hill household! Despite the very credible scores of the other medalists and with all respect to them, Grace Davies was in a league of her own not only within the age group but within the whole of the level 7 competition. She was top on three of the pieces and second by 0.05 on the other on her way to an utterly convincing victory. Grace achieved the highest vault score of 11.50 for her handspring flatback, achieving greater height and flight than many of the much taller and older gymnasts; her bars was near faultless (12.40 from a 13.00 start; 1st), she was solid and confident with hardly a waver on beam (12.35; 2nd); and finished her competition in style on floor where her delightful routine earned her the top score here of the entire day (13.30; 1st). Grace’s total of a massive 49.55 was the most convincing of the day and earned her the gold medal and the first of TNAG’s overall trophies as she outscored all of the other age group winners by a big margin. Grace will start out on the elite path in 2015 and should do so with confidence; her future is surely an extremely bright one indeed. 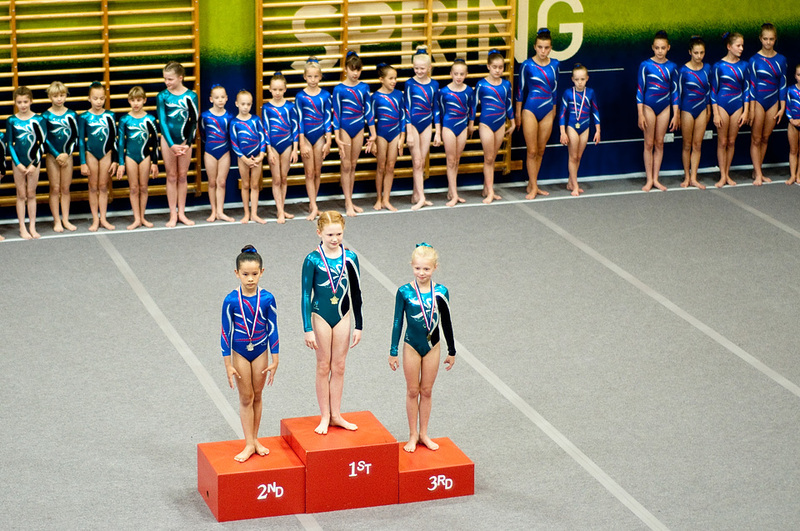 By comparison with some of the other categories, TNAG had a relatively low entry of only three gymnasts in the 8-9 years section amongst a total entry of fifteen with two of those hailing from intermediate classes. Abigail Baker did fantastically well to stick her beam under pressure and was also strong on bars (11.75) on her way to a ninth place finish with 41.85. Just ahead of her was Kiara King who put in good scores on vault (10.8) and bars (11.95; 2nd in the age group) but was slightly weaker on beam and floor to finish eighth with 42.40. Lydia Hawker is back with the club after taking a break from the sport and has returned with renewed enthusiasm and greater maturity. This showed itself in her excellent performances today with Lydia having the composure to allow her considerable talent to shine through. She posted note-worthy scores on all four pieces but it was beam, where competitions are so often won and lost, that was Lydia’s crowning glory with an excellent hit routine for 12.05 (third across the level), and her 12.5 on floor was also very impressive. Lydia took the gold medal with 47.40, a margin of over three marks ahead of her nearest competitor, in what was perhaps one of the biggest surprise victories of the day. For a gymnast that trains only three hours per week this is a fantastic achievement. All of the gymnasts in the 10 yrs plus section were from intermediate classes but all competed with the style of gymnasts training far more hours, in another big field. Sophie Brook showed great style on vault (11.15) and floor (12.25) but did not have a happy time on beam which kept her down in thirteenth place with 40.50. Poppy Pothecary was the top scorer of the age group on bars (12.00) and finished in a creditable eighth place with 42.95. Halle Glayhsher made a great bid for a medal and posted very strong scores on vault (11.45; first in the age group) and floor (12.7; third in the age group) but sadly came to grief on beam which kept her just outside of the medals, finishing fifth with 43.85. Kaitlin Howard posted some of the most consistent scores across the pieces, with scores staying in the 11s throughout; her best was 11.75 on bars. She was one of the few gymnasts in this section to hit their beam, and this carried Kaitlin to a bronze medal, with a score of 45.50. Charlotte Bevington showed some beautiful gymnastics and picked up the top score on floor of the age group and second top of the whole level (12.95). Even with a fall and missed requirement on beam, Charlotte’s class showed through and she was still able to take a well deserved silver medal with 46.00. Lily-Rose Colbert joined the club less than six months ago and has added polish and finesse to her existing talent, which all paid dividends today. Lily-Rose put together an excellent set of scores with her best moments coming on beam (12.40; first across the level) and floor (12.85; 3rd) on her way to the winning score of 48.20. 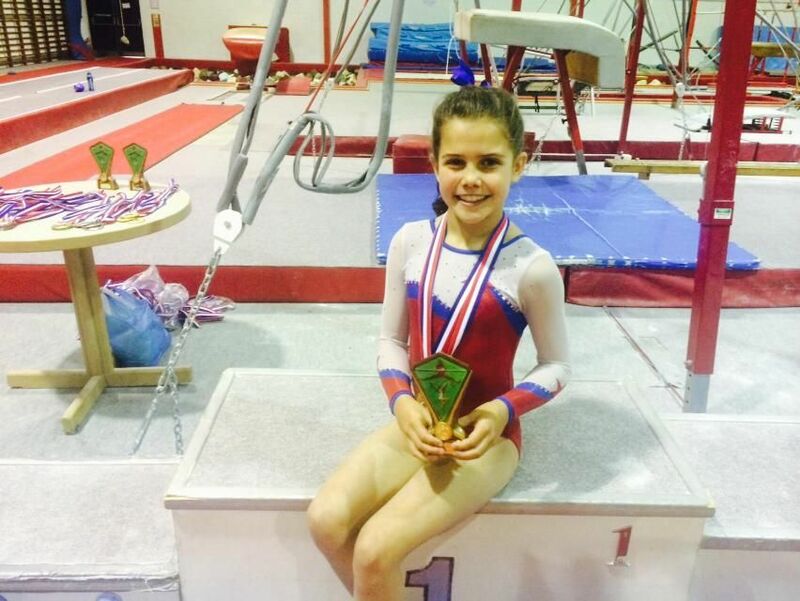 This earned Lily-Rose the club’s third of the three gold medals available at level 7 in what was an excellent first round to the competition for the Academy squad. 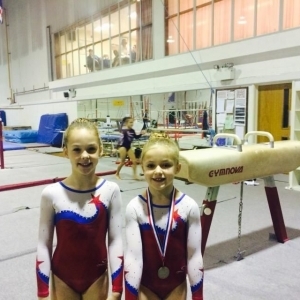 The middle round of the day was the biggest, with forty-six gymnasts contesting three age groups of county levels 6 and 5, plus the elite level 5 for eight year old regional level gymnasts. The level 6, eight years category was one of the highest quality contests of the day with only four competitors, but all showing strong gymnastics for their age. Tabitha, competing for TNAG for the last time, had another clean competition with strong scores on bars (11.2) and beam (10.6) for a fourth place finish. Amelie Green also had a clean competition and matched this with good execution of her routines which were just a little simpler than the winning gymnast. Amelie scored a strong 46.05 to pick up a silver medal. In the 9-10 years section, the four TNAG girls competing were all closely matched across the competition and ultimately had an excellent result filling out the top four positions. Lucy Hutchinson, training for only two hours per week, showed that her class and ability remains firmly intact, posting one of the top vault scores (11.40) and also one of the few gymnasts to hit 12.00 on bars. It was a slightly wobbly beam which kept Lucy out of the medals; finishing fourth with 45.75. Jessica Sharp started in style with an excellent floor (12.7, top of the level) and followed this up with solid performances on the other pieces. Jess seemed a little harshly dealt with on a clean beam routine but has the ability to improve upon this in the future. She took the bronze medal with 45.95. Eden Hill has worked extremely hard in training for this competition and that hard work was rewarded with some good scores, not dropping below 11, and a great result. She hit 12.65 on floor and 11.3 on both vault and bars. Even with an uncharacteristic fall on beam, Eden still picked up 11.2 here to take the silver medal, scoring 46.45. Bethany Gates was ultimately catapulted to the top of the section due to one excellent routine which was deservedly rewarded. Having started her competition solidly but not spectacularly on floor and vault Bethany went to bars and delivered one of the best performances of the day on this piece. She was one of few gymnasts to be credited the required cast above horizontal, and also picked up the 0.5 bonus for her long upstart, giving her a high start value with few deductions. 12.90 was the top score of the level by some distance. Bethany followed this up with a stuck beam routine to earn her a total of 46.70 and her first ever gold medal. 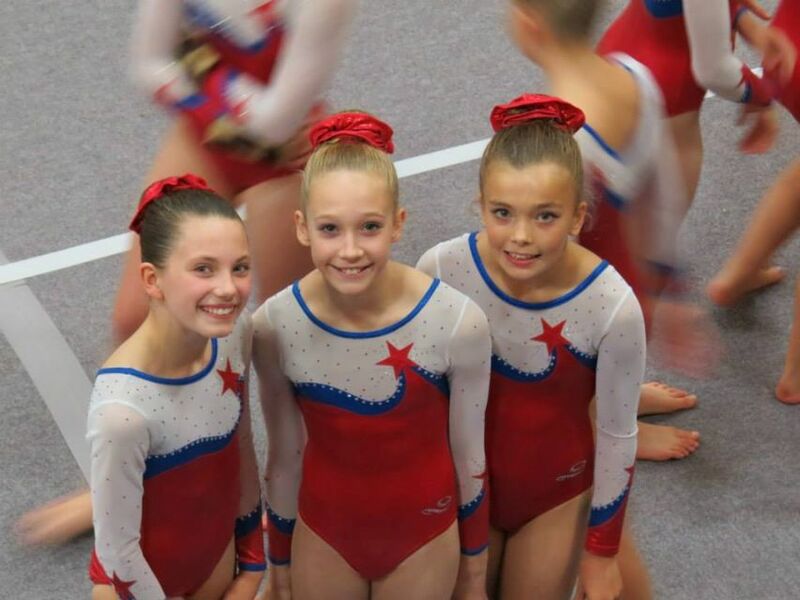 In the 11 years plus section, there were again four TNAG gymnasts competing and again they ultimately filled out the top four ranks. Fourth was Rebecca Bennett who posted some good scores in particular 11.65 for her super flighted vault, top of the level and 11.80 on bars and 12.00 on beam, but just couldn’t quite get comfortable on the beam. Her total was 44.80. Taking bronze was Aura Sprong who rose to the challenge of competition as she always does and achieving a very consistent set of scores, the best of which were 11.5 on bars and 11.55 on floor on her route to a total of 45.10. Just ahead in the silver medal position was Ezara King who once again held her nerve on beam (11.15) and put in a pleasingly artistic routine on floor for 12.65 (2nd). Ezara’s total was 45.35. The gold was taken by a reasonable margin in gymnastics terms, by Milly Bourke, a gymnast who only moved into the squad system a few weeks ago, with a score of 46.10. Milly was solid in the 11s on vault, bars and beam and was another of the TNAG gymnasts to really impress on floor, scoring 12.60 here. This completed the second clean sweep of the medal rostrum in the level 6 competition. The new county level 5 contains far harder requirements than the old one did, and as such sets new challenges for the gymnasts. They are also permitted to demonstrate some of the harder B value elements not previously allowed. Such are the demands of the level, that Naomi McCabe was the only gymnast in the competition for nine year olds. She had mistakes on bars on her giant circles (which she was the only gymnast in the level to perform and normally does so with ease) but otherwise gained excellent scores most notably on beam (12.95; 1st) and floor where she scored 12.00 even with a missing requirement. Naomi’s gold medal winning total was 46.10 and she should move to level 4 next year with confidence. Emma Wilder was the sole TNAG representative in a big field of 10-11 year olds, many of whom had far more experience than she. Emma rose to the challenge admirably. Like Naomi, her best scores came on beam, where she was solid and beautifully elegant (12.45) and floor, where she included her recently learned tuck back somersault in another elegantly performed routine, for 11.90, the top score in the age group. Emma was delighted to be rewarded for her efforts with a total score of 46.95 and a well deserved silver medal. Yet again, a TNAG quartet filled out the top four places in another age group, this time the level 5, 12 years and over category. Olivia Wickham was competing at levels for the first time for the club and has developed very well with her skill level in recent months. She posted strong and consistent scores across the pieces, just dipping slightly on beam where she managed a stuck, but wobbly, routine. Olivia ultimately missed out on a medal by 0.1, finishing fourth with 45.85. Just ahead was Sophie Potter who has recovered remarkably quickly from an elbow injury sustained two weeks before the competition, which has obviously hampered her routine preparation. Sophie was a little up and down with her scores but her crowning glory as ever was a highly expressive and impressive floor routine which took the top score of the level with 12.45. She took the bronze medal with 45.95. Megan Newbery was shocked to be announced as the silver medalist but her classy display of gymnastics more than warranted that reward. Megan was one of few gymnasts to be credited with the cast above horizontal on bars which lifted her score to 12.40 (1st=) . Even with a fall on beam, Megan still achieved 11.50 here, second of the age group and when combined with solid performances on floor and vault saw her take that surprise silver with 46.95. After an excellent performance at Bury a few weeks previously and some more impressive work in training, Hannah was probably the favourite for this title. She demonstrated new maturity in dealing with the pressure of that expectation and handling her nerves which have got the better of her in the past. Hannah got off to a great start with 12.05 (from a 12.40 start) on vault and was clean on bars (11.85) but her performance of the day came on beam where she had great pace ad presentation combined with clean skills and hardly a wobble. 12.70 pushed her to within touching distance of the gold, and she sealed her victory on floor with her usual delightful package for 12.30. Hannah took the gold medal with 48.90 and was also announced as the overall winner for the level 5 section across the age groups. 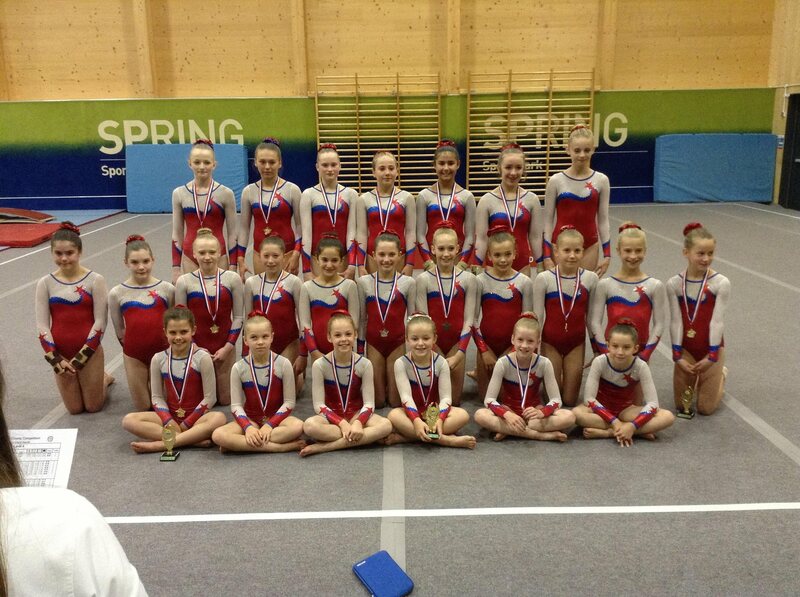 The final section on show in this round was for the elite level 5 gymnasts. 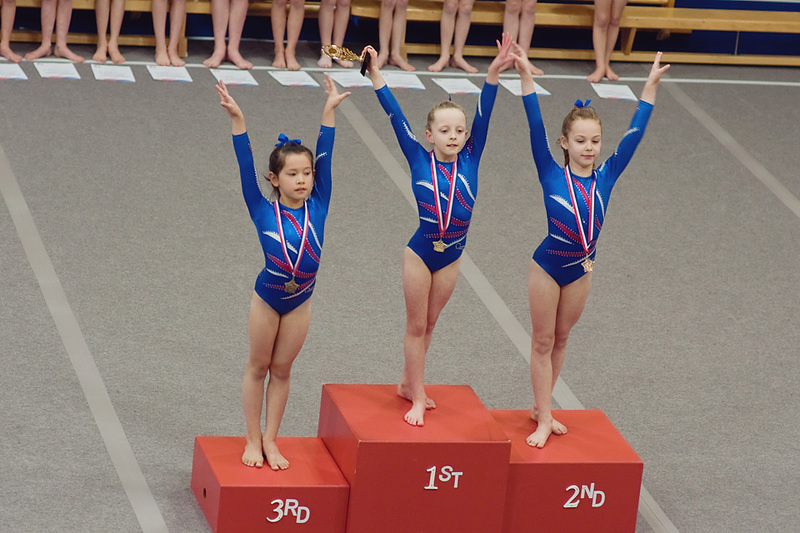 This category is open only to gymnasts turning aged eight in the competition and is based on the regional level 5 rules, which are even more demanding than the new county level 5 rules. Millie Hart and Poppy Chapman aced up to one gymnast from Norwich in the battle for medals here. The TNAG pair were fairly closely matched across the pieces, both vaulting well at the straight front vault (Poppy 12.90 1st; Millie 12.70 2nd). Millie went through a clean bars for 11.70 and this was where Poppy put in one of her best performances, showing great amplitude on her well shaped casts, hitting handstand on the low bar. Her score of 12.10 seemed a little baffling in comparison to the other scores in the section. Both girls knew that their bids for gold could be thwarted with mistakes on beam but both did fantastically well to stick their routines. Here Millie was particularly solid and received the top score; 11.60 to Poppy’s 11.35. The girls also finished in style on floor, both putting in artistic performances and landing well their flightly somersaults. Poppy was once again just ahead with 11.55 to Millie’s 11.10. Millie should be delighted with her silver medal, and her total score of 47.10, a strong one at this level and just reward for her much improved level of work in training over the summer period. Poppy took the gold with 47.90 and impressed judges and coaches alike with her technically strong gymnastics, which she is well placed to build on in the future. Poppy of course also took the overall trophy in the section. So, with the competition two-thirds complete, the Academy had landed twenty-one medals and three of the four overall trophies on offer but there was much still to be decided. The level of gymnastics shot up dramatically with the level 4, 3, 2 and FIG girls entering the arena. TNAG showed their dominance before the competition even started with the club fielding twenty-four gymnasts at these levels; the rest of the county’s clubs amassing only six between them. 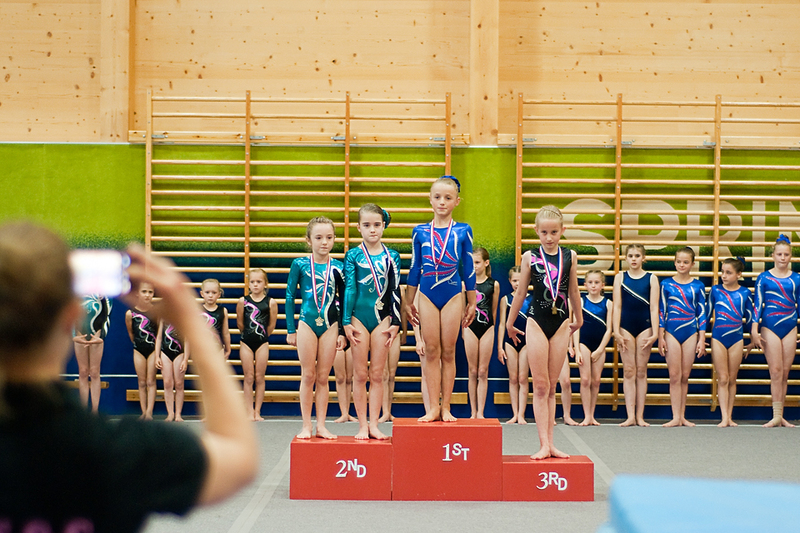 At level 4, there was an internal battle with gymnasts from ECS2, ECS3, CCS1 and CCS2 all show-casing their skills. It was just Emma Atkin and Lily Tranfield at in age 4, where the rules are slightly different to those used for the out of age girls, particularly in relation to the vault set up. As the first two gymnasts up in this round, Lily and Emma put in performances which were not bettered for the whole of the level 4 competition. Lily started with a clean full twist for 12.05 and Emma showing her usual belnd of precise acrobatics and lovely artistry for 12.55. 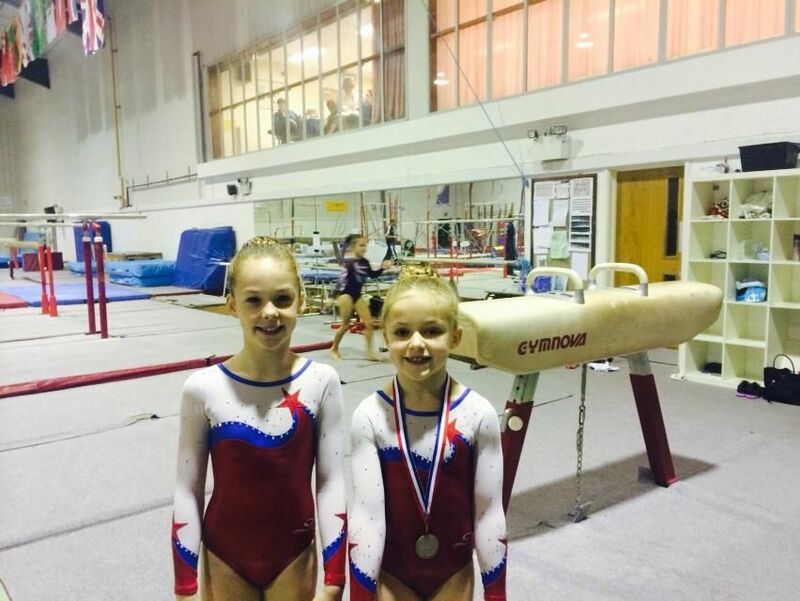 Both girls showed clean Yurchenko preparation vaults, the highest value vaults they are permitted to perform for strong scores again (Lily 12.70, Emma 12.90). Moving to bars, there were a few hiccups with the scoring, but the girls both did their jobs with clean routines. Ultimately Lily picked up 12.45 and Emma hit 13.00, the equal top score of the section (and of the day on bars) for her well shaped giants, and flighty backaway. Finishing on beam these two talented gymnasts who can hit their beam routines all day long in training, delivered on that preparation with stuck exercises under pressure. Lily with hardly a wobble for 11.70, and Emma with slightly higher difficulty and stamping out a couple of small wobbles for 12.10. Lily has not previously competed alongside the elite path gymnasts of her year group and has made the step up comfortably and confidently. She should be delighted with her total of 48.90 which gave her the silver. Emma took gold with 50.55, the highest total of the entire day and with it the overall trophy. An exciting season lies ahead for her. With regional finals places on offer, the battles at level 4 out of age were some of the fiercest of the day. In the 10-11 years section, Martha Marsh did not have her best day, with mistakes on bars and beam. Having added lots of new work to her programme on these pieces and having been unavoidably absent from training for some of the preparation time, Martha should take positives from her strong showings on vault and floor and know that she still has massive potential for the future. Martha finished seventh with 42.40. Emily Ledsham-Darter was consistent on three of the four pieces but had a lapse of concentration on beam leading to a mistake here in what would otherwise have been a clean competition. Finishing sixth with 44.50, a very respectable score, Emily knows that to improve on this position next time around and give herself a chance of progressing to regionals, she must now get down to the task of adding difficulty to her routines. 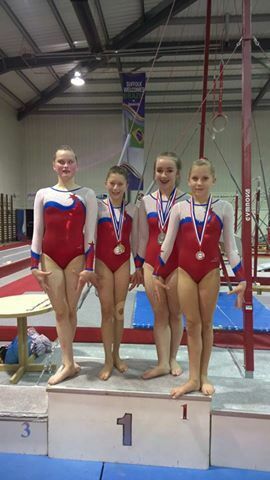 There were, with all respect to the other competitors, four gymnasts in a close battle for three medals and regional finals places and it was a great shame that one gymnast had to miss out. The fourth placed gymnast was ultimately Alice Tall who was fantastic on bars (12.8; 3rd), and solid on her two slightly weaker pieces of floor and vault, but could not afford the mistake which she had on beam; the second of her usually strong pieces. Her lower score here saw her just miss out on that podium place, finishing fourth with a still impressive score of 46.20. Erin Houlihan has had a long absence due to injury and is competing this season for the first time in 18 months. Unusually, the competition nerves got to Erin slightly on beam where she had a fall, but was still extremely clean here that aside, and her score ultimately wasn’t disastrous. Erin was strong on bars (12.70) and best of the age group on floor (11.70) on her way to the bronze medal with 46.35 and a regionals place. Hallie Snelling put in four routines at the absolute optimum level for her; if she could repeat the competition ten times over she wouldn’t have been able to do any better – to achieve this level of performance when it matters is precisely what all coaches and gymnasts are aiming for and Hallie delivered that here. Her floor had its usual fantastic preparation (11.40) and her bars is massively improved in recent weeks (12.5) but Hallie’s best performance came at the end, on beam, where she was clean and solid on all of her skills and crisp and sharp in her presentation, for 12.10 which shot her up to a fantastic silver medal position with 47.05. Annie Young continued her astronomic rise with her second county title in six months. Having progressed to a level beyond all expectations in recent months, Annie’s biggest challenge came not from her competitors, but from herself – the demands of the gymnastics she handles with ease but her task was to handle herself and the nerves under pressure. Annie showed improved control on her landings on floor to get off to a solid start (11.40) and her vault rightfully delivered the top score for a handspring in the level 4 event (11.70). Annie’s giants are some of the best in the club, and she was rightfully rewarded with the top score here (13.00) and this put her in a string position with just one rotation remaining. The beam has always been the test for Annie but she showed maturity here sticking her acro series cold. She did miss her leap series here and this kept her score down slightly; she will need to improve on this for regionals. However, today, it was enough and Annie took the county title and ultimately the overall trophy for out of age 4, with 47.30. The competition was equally fierce at 12-13 years, with five TNAG girls eventually filling the top five places. Abi Gardiner continues to suffer at the hands of a long lasting illness and is training less than half her normal hours. To achieve a clean competition and a total score of 44.75, placing fifth, in these circumstances, is a great achievement for Abi. Iris has made good progress this year and added some new work to her programme. She was disappointed to fall from beam on a relatively simple spin, but should take confidence from landing her acrobatic series for the first time in competition. She was precise and tidy on bars and floor picking up 11.80 and 11.45 on these pieces respectively finishing in fourth with 45.00. All three gymnasts in the medal hunt had clean competitions meaning the order of the battles came down to the odd tenth or two here or there. Benodet Houston-Campbell should take only positives from this event and her results. She put in precise routines with solid and consistent scores across the pieces and her reward of a bronze medal and regional final placing was a just one. Abigail Ashford has used the year to tidy up and refine the skills she competed a year ago, and adding a few new twists on them, all against the backdrop of a painful knee injury. Abi’s best performances came on bars, where she was the only gymnast in the age group doing giants and these were justly rewarded (12.75) and beam where she was solid and precise for 11.60. Abi took a deserved silver medal with 46.75. Annie Shaw showed some of the classiest gymnastics of the day on her way to the county title and is now getting somewhere near to performing at a level to do justice to her considerable talent. She controlled her power well on vault (11.60), and put in the best basic bar routine of the day (12.10). Annie’s artistic qualities shone through on beam and floor. On the former, she combined a stuck acro series with excellent leaps and presentation for 11.60; and on floor her new routine was stunningly performed for 11.85. Annie must continue to work at her highest possible level in each and every training session but should be confident that, if she does so, further success is within her grasp. Annie was delighted to take the gold medal with 47.15. Naomi Bash was the lone competitor in the 14 years and over section but she did not rest on her laurels and was keen to put in her very best performance. And, aside from a mistake on beam, she delivered on that aim. Naomi will probably be proudest of her score on vault of 12.00 for her half on, full off. This was the highest of the out of age 4 gymnasts and it signals a real step forwards for Naomi who has previously found the power events quite challenging. With clean bars and an expressive floor, Naomi took the gold with 45.20. 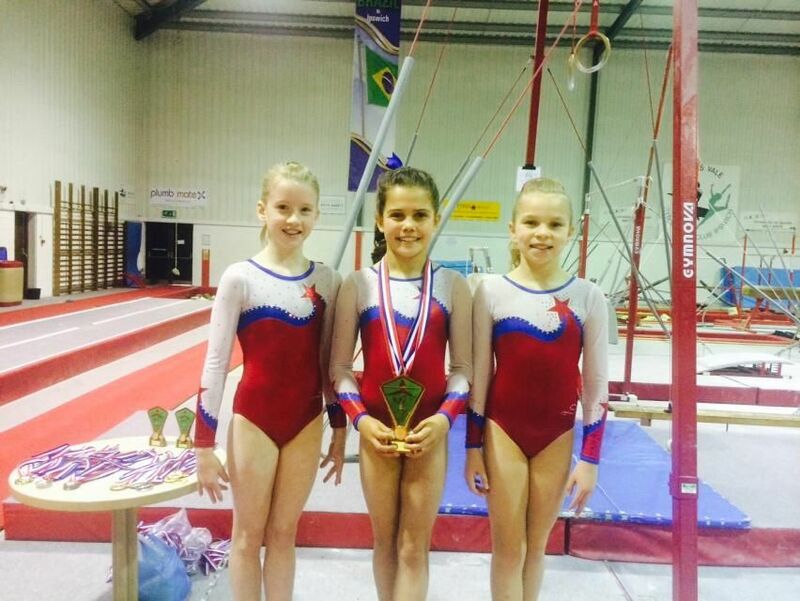 There was another super fierce battle for medals and regional places at level 3, age 11-12 with four ECS2 gymnasts fighting it out. Once again, sadly one gymnast had to miss out and on this occasion that was Grace Luckhurst. She landed her tsukahara vault, which has been a long term project for Grace and her coach Helen, for the first time in competition and scored 12.00 here. She went cleanly through bars with her clear and turns for 11.65 but it was beam where, despite not falling, Grace lost out on a medal, with for her a shaky routine. Grace’s floor score was also a little down on her performance at Bury but this is the way that scoring can go from one event to the next. Grace’s total of 46.00 was a fine one and she knows that she can improve on beam for future events. Kylah Tranfield is easily able to handle the demands of this level on bars and beam where so many struggle and she coupled this with solid performances on the power events of vault and floor. Her top score came on her beam where her flick flick was rock solid (11.95), and her bars was the best of the level (11.80). Kylah is capable of a good result at regionals, and even of adding new work to her routines, if she is able to train at her best level every session. Eleanor Hayward was one of the club’s most decorated gymnasts during last year’s voluntary season and she will be hoping to repeat that success this time around. Eleanor’s bars were clean and classy (11.70), beam sharp and elegant despite a slight falter on the acro series (12.05) and her beautiful floor was her crowning glory. 12.30 was the best score of the level here. Eleanor took the silver medal with 47.85 and she too is capable of building on this if she can add difficulty on a couple of events as the year goes on. Emma Hill was once the fifth best gymnast in the country at compulsory level 4, so has a clear pedigree and undoubted ability. After a break from the sport she returned to competition this year with new maturity and drive but still only trains three sessions per week, so to take a county title against that backdrop is testament both to her talent, and determination. Emma landed her tsukahara vault well for 12.30, and her elements on beam and floor are so clean that deductions are hard to find (12.40 and 12.15). Emma’s total of 48.40 is a big one and her gold medal is a well earned reward for both gymnast and coach. 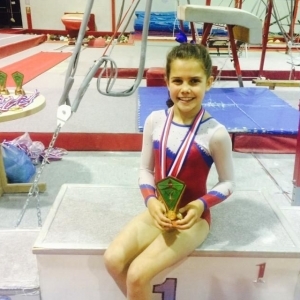 At level 3 aged 13 plus, Anastasia Hannah was the gymnast to miss out on a medal in a category that she had the ammunition to score well in. With mistakes on floor and a void vault, Anastasia sadly put herself out of the running, but will want to come back strongly and correct these errors at future events. Chloe Moore was battling soreness through her competition which affected her strong pieces of vault and floor but even without her best performances here Chloe still was able to make the medal rostrum with 42.10 for the bronze medal and will know she is capable of improving on her scores for regionals. Lowri Davies sustained an elbow fracture only a couple of months ago and her participation in this event was in doubt until the last minute. Thanks to a combination of excellent medical care combined with hard work from gymnast and coach alike, Lowri came back not only to compete but to take the gold medal and county title. Lowri had mistakes on bars and beam but sealed her victory with top scores on vault, 12.3 for her tsukahara, and floor where she competed her delightful new floor for the first time, for 11.70, taking the gold with 44.65. As she continues to regain strength and head towards full fitness Lowri is capable of even better performances in the future. The final level on show was FIG where of course TNAG was the only club to provide entrants; one in each of the three age categories. The espoir champion was Laura Rose Cooke scoring 42.65 on challenging full FIG code scoring. Laura has faltered a little in recent competitions and where previously she has been a great competitor but she is starting to understand that solid preparation is most likely to lead to solid competition and to take more responsibility for her own development. With several new skills in the pipeline Laura will thrive on the new challenges of competing at junior level next year. Laura Glover took the silver medal and ultimately the overall FIG trophy with a strong score of 45.00. As ever, Laura’s top scores came on her specialist events of vault (13.00 for a great straight Yurchenko) and floor (12.00 for the debuting of her newly choreographed routine) but she will be equally pleased to have battled through her bar routine, where she is equally able. 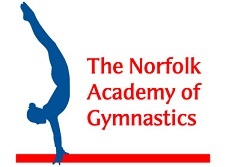 To be crowned Norfolk FIG champion as a relatively late starter in the sport and as a gymnast who has never gone down the compulsory levels path, is a great achievement for Laura and inspiring for many of the other girls. Emily Crowe competed for the first time since the British championships in March, and since then has undergone further elbow surgery which has sadly left her with severe nerve damage. Competing a one armed floor routine which was stunning as ever (12.90) and a beam without any arm support (12.35) Emily chose to vault the day before the competition for the first time in five months and was still easily able to pop out a straight Yurchenko. As the only senior gymnast, Emily took gold with 37.65 from three events. Her scores and performances are a reminder of her class and talent; her determination and desire in getting to this point signal her continuing love for the sport. So, TNAG picked up a further seventeen medals and four overall trophies in the final round to take the medal tally to thirty-eight and the trophy count to seven, to cap a highly successful county championships where the successes came very quickly and the memories will fade slowly.